Doesn't anyone ever consult my Longman Pronunciation Dictionary? There you will find both preference statistics and graphs for wɪθ and wɪðin both American and British English. Also a note mentioning that "in Britain, wɪθ is nevertheless frequent in Scotland" – again, with statistics. I suppose the problem is in the phrase “finding it online”.People now no longer look for information in books, or in libraries: they expect to be able to locate it in in Wikipedia or via Google. They don’t want the inconvenience and expense of buying a book or locating the book in a library. In my defense, I will note that my little "How to pronounce with" post was written in haste as I was about to head out to the airport to fly to Amsterdam (ironically, for a committee meeting to discuss plans for a conference on "Patterns of macro- and micro-diversity in the languages of Europe and the Middle East"). I do own a copy of LPD, but frankly I'm not sure which of 15-20 bookcases in which of several places it's in, and I didn't have time to look for it. So I worked from (as it turns out not very well informed) memory, and from those resources I could quickly find online. Anyhow, I had a spare hour today in Amsterdam, and I happen to have the TIMIT database on my laptop, so I thought I'd take a look at what it tells us about American pronunciations of with in various contexts, at least as of the time it was recorded (circa 1986). In the voiceless examples, the consonantal interval may be realized as a voiceless interdental fricative, or as a voiceless unaspirated dental stop (as in "attacked the" above), or as a combination of the two. Something odd: Out of 12 sentences containing within (one set of 7, and 5 singletons), there were no instances of voiced with, though there was one example in which the medial consonant was simply a voiced tap, as though it were spelled "widdin". And there are mixed cases, with bits of frication before and/or after a stop-like region. There's also the question of vowel duration in with — in American English monosyllables, timing is often the strongest cue to final-consonant voicing. But I've run out of time for today. "And wouldn't it be nice if LPD were online? Pearson now owns Longman, I believe — they've got the expertise to do it easily"
Ah, the innocence. A thing can be put online, so why shouldn't it just happen, to spare me the minor inconvenience of using the book or even the CD? Don't tell me highly-qualified people actually make their living working on dictionaries? Hey, it's all just data. @Harry Campbell: Things that are online don't have to be free — they could charge a subscription fee if necessary, as the OED does. [(myl) Exactly. I'm somewhat familiar with the economics involved, for reasons explained below. Recently, the author of an excellent if specialized dictionary wanted to explore finding an online home for it (and its supplementary files) at the LDC, an organization that I direct. He had previously been turned down by the dictionary's current publisher, who (I gather) didn't have the technical capabilities that he wanted. But he needed a modest income from the enterprise. Although the LDC does derive income from selling linguistic data in digital form, including lexicons, our customers are mainly speech and language oriented R&D organizations, and the market for the dictionary in question ought to have been a much broader segment of the intellectual population. I tend to assume that it isn't lavish royalties paid to John Wells that are responsible for the possible infeasibility of making this particular work available free on the web (although if I'm wrong about that, good for him and I hope he's spending it all on caviar and champagne). As a counterexample to the OED, it has been noted on this blog before that the proprietors of the MWDEU have made it available to anyone surfing google books in its entirety, for all the world like a competently-scanned pre-1923 public domain work, rather than just permitting access in limited teaser-snippet excerpts. I don't know if they figure they make up in good will what they lose in revenue or what the motivation is, but they're not a non-profit. [(myl) Indeed. Another notorious laggard in this respect is Cambridge University Press. The Huddleston & Pullum Cambridge Grammar of the English Language would be much more useful if it could be searched and accessed on line — despite Geoff Pullum's excellent index, the unwieldy physical size of the book and the intrinsic inferiority of physical search often make it unreasonably hard to find something in there. But CUP seems entirely unmotivated to do anything to fix this problem. I apologise for my earlier sarkiness, but there does seem to be a lot of academic innocence about commercial realities. People often seem to assume that publishers exist to improve the sum of human knowledge, or in this case the accessibility of academic resources. In fact they are about making money. Could a highly specialist item like a pronouncing dictionary really make decent money online? When every bog-standard dictionary already on your shelf, or even free online, includes pronunciation? It seems unlikely to me, much as I'd love to be proved wrong. What tiny percentage of those who consult a generalist dictionary to find out how to say a word are interested or knowledgeable enough to want or understand the treatment given by a specialist pronounciation dict, and how much would they pay for that? The OED is totally different, for many reasons, eg (1) It's the OED. Everyone's heard of it even if they haven't a clue what it actually is. Every two-bit journo or essayist wants to begin an article with a clichéd reference to how the "Oxford Dictionary" (or worse "The Dictionary") defines something. (2) Yes it is, effectively, free in the UK, through the public library system. I'd love to know many private individuals actually pay the monstrous £250 fee every single year to glance between its online covers. (3) It's a famous national treasure, built up largely through vast amounts of voluntary labour by contributors, backed today by public money in various forms not least the tax breaks given to university presses. Even so, OED have shown in the past how little they care about, what was the phrase, "generating goodwill". They don't want goodwill, they want money. They are a cash cow for the university and dare one say it, tax breaks or no tax breaks, quality is not the overwhelming concern. Meanwhile Pearson is a purely commercial operation. Oxford Reference a huge package of many dozens of titles that you can sell on the basis of its impressive scope to generalists everywhere, not just to a handful of phonetics specialists. It's hard to imagine them putting online their Dictionary of Law Enforcement or Superstitions or Popes or "Insects and their Allies" as a stand-alone product and expecting it to make money. How many comparable titles could Pearson put into such a package, what would be the cost, and could this unfamiliar brand really compete with the revered "Oxford" that every consumer in the world seems to imagine is the natural leader in the field? I hope I'm just being cynical and that it will happen some day, but I'm not going to hold my breath. For what it's worth I didn't think John Wells' post was 'querulous' (or to the extent it was, it was perfectly understandable). It reminded me slightly a little of some of Geoffrey K. Pullum's posts where he righteously goes off on prescriptivists who don't understand the rules they're pushing. Here's a discussion instigated by a professional linguist* with the participation (I assume) of some others theorizing about a question that has been researched and no one getting around to checking offline resources. If it had been my published work (and if I were a linguistics superstar) I would have been very annoyed. *I understand the time constraints for that posting and the peculiar nature of online discussions and this i not meant as criticism of Mark. I was glad to see the issue discussed since as a decided non-voicer I was very surprised the first time I saw the voiced pronunciation in a dictionary. A little OT but I would like to add my voice to the criticism of the OED's individual subscription model. I am in the unfortunate position of belonging neither to a university nor to a public library that has an OED subscription. I have seriously considered getting an OED subscription: I would be happy to pay something like $5 a month for access. At the prices the OED charges ($30/month or $295/year in North America) I can't imagine anyone other than a millionnaire philologist taking them up. I too would be very interested to know exactly how many individual subscribers the OED has. What I don't know is what the "preference poll" data is supposed to mean, how it breaks down by region/class/etc within the US, and how it would compare to spectrographic analysis of the actual speech of those polled. The old late '70's printing of the AHD which is the only hard-copy English dictionary in the same room as this computer gives both voiced and unvoiced pronunciations without any suggestion that one is regional or stigmatized or lower-prestige, but with the voiced one listed first, which seems odd if US preferences and/or usage are skewed so overwhelmingly the other direction. 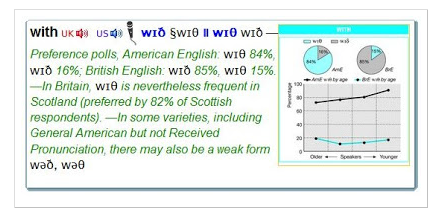 Professor Wells in his linked blogpost suggests that "wit" might be heard from what he calls a "NooYorker" (perhaps non-rhoticism is interfering with what I would consider the standard eye-dialect spelling of "Noo Yawk"?) whereas I associate the "wit" variant with the environs of the UPenn campus, in particular as seen in the canonical South Philadelphia question "wit or witout?" (meaning "do you or don't you want grilled onions on that cheesesteak?"). Perhaps myl's distinguished colleague Profesor Labov has conducted relevant fieldwork? Is it significant that the standard eye-dialect spelling is not "wid or widdout"? A little late to this, but here's real-live linguist clearly favoring the voiced version of "with".